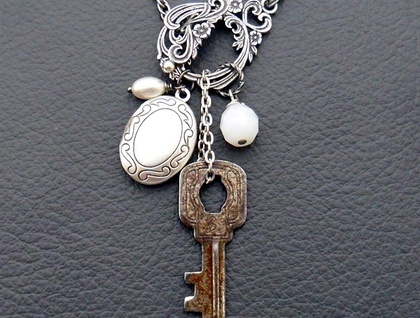 This unique, vintage-look cluster necklace features a silver-plated locket, a rusty old key, an antique moonstone-coloured glass bead, and a vintage Swarovski pearl, all dripping from an ornate, old-fashioned-looking toggle clasp. The chain is a strong, rope-style chain, brass based for durability, plated with silver and then antiqued to give a vintage appearance. The beautiful clasp has a Victorian look to it, and is likewise brass based, silver plated, and antiqued to show up its lovely floral details. Front-fastening necklaces are convenient if you have difficulty reaching behind your neck. A clasp this fabulous has to be at the front of the necklace where it can be admired! The locket is made of brass that has been plated with silver and then antiqued to show up the details of its decoration. It opens and closes firmly but easily, and inside it are two oval spaces for two images or photographs, measuring 14mm by 9mm. You could also add a tiny piece of fabric or ribbon, a note, or some other small thing. 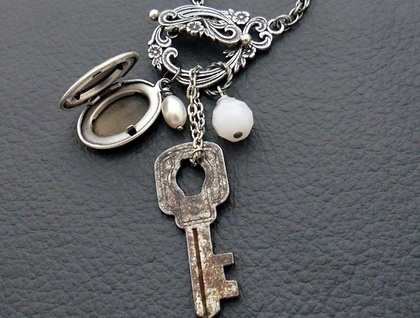 I recommend adhering your treasure to the inside of the locket, or stuffing it in securely, to be certain that it won't come loose and work its way out. Swarovski pearls are made by the makers of the famous Swarovski crystal, and have a crystal core that simulates the weight and feel of a real pearl. They are fade- and perfume-resistant, with a luxuriously smooth, flawless finish; and are generally regarded as the best imitation pearls on the market. Vintage Swarovski crystals and pearls are in fact collectors' items. This particular pearl is oval in shape, in the Swarovski colour ‘creamrose’. The faceted glass bead is antique (at least one hundred years old), and has a milky, opal-like translucence designed to resemble moonstone. The key is very old, of unknown age and provenance. I have sealed it to preserve its aged look and to prevent any rust or tarnish from spreading to your other jewellery. It hangs from the clasp by means of a loop of silver-coloured, flat cable-style chain. ‘Lady Abigail’ is a one-off design, never to be repeated. Unlike most Silverlight Jewellery designs, this necklace cannot be altered in length. 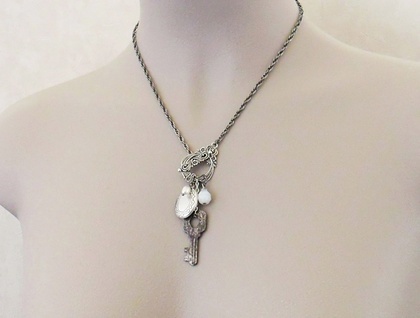 The necklace chain measures 45cm, not including the toggle clasp. When worn, the ‘fall’ from the top of the toggle clasp to the bottom of the key measures 82mm. 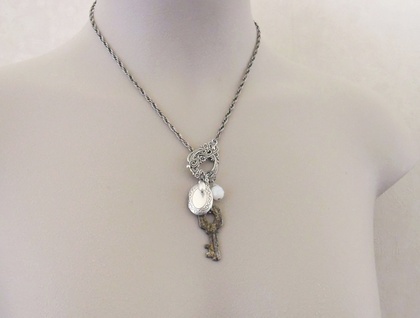 The locket measures 22mm lengthwise, not including the little hanging loop at the top, and 16.5mm across. The key is 36mm lengthwise, while the antique glass bead is 9mm across.